Don't know your counted thread from your freestyle? Not heard of bargello? Get up to speed with our illustrated guide. The craft of hand embroidery is practised all over the world and involves a vast number of techniques, stitches, threads, base fabrics and embellishments. There is no universal way of classifying embroidery, as different cultures use different terms to describe stitches and techniques. This guide introduces some of the most common embroidery styles found in our collections, divided into three main types: counted-thread, freestyle and whitework. Bargello work is a form of needlework that is usually stitched on a type of single-thread canvas, and is characterised by the use of a single vertical stitch called the Florentine. In the classic row-based bargello design, adjacent stitches jump either 'two up' or 'two down' to form regular peaks and valleys that create the illusion of wave-like bands. The origins of this style are uncertain, as indicated by the variety of names it goes by: flame stitch, Florentine work, Hungarian point and Irish stitch. Regardless, bargello work was abundant in Florence during the Italian Renaissance and was traditionally used to make domestic upholstery. Berlin woolwork is a form of hard-wearing needlepoint embroidery in which a single type of stitch is worked on canvas fabric. Characteristic of this style is the use of patterns printed on 'point' paper, with squares corresponding to the squares on the canvas. Mostly available as affordable single sheets when they were first produced in Berlin in the 1800s (hence the name), these patterns sold in large numbers, creating something of a craze in Victorian Britain. By 1840, more than 14,000 had been imported into the country. Traditionally, many bold shades of wool were used to create three-dimensional effects that made striking furniture coverings and cushions for the Victorian home. Blackwork is an elegant, monochrome form of embroidery that was traditionally used to decorate clothing accessories, such as caps, collars, cuffs and sleeves, throughout Europe in the 16th and 17th centuries. 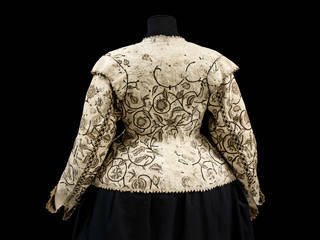 Usually worked on fabric with an even weave, 16th-century blackwork used counted stitches to form small repeating geometric or floral shapes; the all-over patterns were called 'diaper' fillings. By the early 17th century, larger, more naturalistic designs had appeared. Sinuous stems connecting flowers and leaves, interspersed with birds, animals and insects were popular. These designs could be printed or otherwise transferred directly onto the linen, but professional embroiderers or artists were also hired to draw new patterns freehand. Cross-stitch is created using one of the simplest and most easily recognisable stitch techniques: two diagonal lines cross, with the second formed over the first. One of the oldest styles of embroidery (the earliest existing example dates from AD 850), it is still one of the world's most widely used. It is cherished in Western culture for its association with honest simplicity – probably the result of its use in piously themed historical samplers, and later, its use in schools. 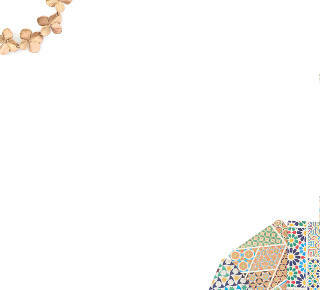 Although cross-stitch is often used to form very simple patterns on an open-weave, gridded fabric, it can also produce extremely sophisticated effects, injecting the illusion of shading and three-dimensionality into figurative subjects. Kogin is a form of Japanese darning-stitch embroidery that originated in Aomori Prefecture, northern Honshu, during the Edo period (1615 – 1868). 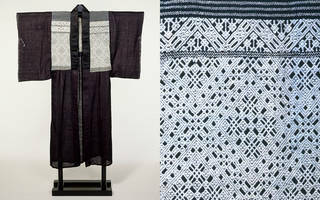 Stitched predominantly in white cotton, parallel counted stitches are worked onto a single layer of background cloth (usually indigo-dyed), to form diamond and other geometric patterns. A craft born of necessity, this style was designed to increase the durability of the thick workwear worn by farmers during harsh winters in the Tsugaru Peninsula. By the early 20th century, kogin had almost died out, but more recently it has been revived for household and fashion items, and promoted as meibutsu (a recognised regional speciality). Canvas work describes any form of embroidery worked on a stiff, open-weave canvas as opposed to other fabrics, most often in a simple tent (diagonal or 'half cross') stitch. Generally, canvas work designs completely cover the canvas and rely on the use of different-coloured yarns to create pattern. 'Petit point' describes canvas work that uses the tiny stitches on canvas with the highest thread count. 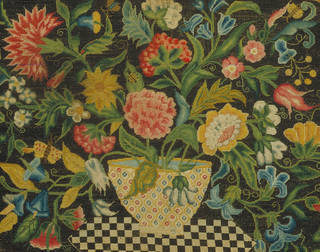 Often used to create areas of detail, this technique was used by Mary Queen of Scots in the embroideries she made to pass the time during her long imprisonment by her cousin, Elizabeth I. Canvas work was a popular domestic craft for women from the 16th century onwards, being used to make bed hangings, decorative hangings, cushion covers and upholstered furniture. Art needlework is a style of embroidery championed in the 19th century by designer William Morris, a key figure in the Arts and Crafts movement. 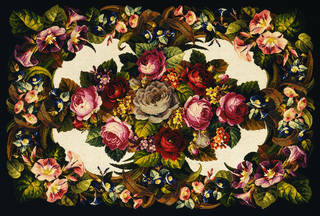 Morris felt that the Victorian obsession with Berlin woolwork was responsible for the decline in needle skills, and instead promoted more traditional techniques, which were often inspired by nature and influenced by historic textiles from Italy, Iran (then Persia) and Turkey. Art needlework was also supported by the establishment of the Royal School of Needlework in 1872, which aimed to restore "Ornamental Needlework for secular purposes, to the high place it once held amongst decorative arts". Experimental work inspired loosely by Art needlework was produced by Jessie Newbery, an embroiderer and teacher at the Glasgow School of Art. 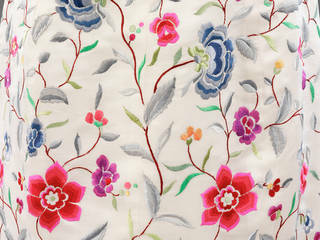 Chinese silk embroidery (xiu) has been practised in China for thousands of years. It typically uses a variety of stitch styles, and a wide range of time-honoured designs: figurative motifs depicting flowers, birds and animals, as well as geometric and abstract patterns. Untwisted (flat) silk threads create a rich sheen and, when combined with padded stitching, create wonderful three-dimensional effects; twisted threads are stronger and create bolder lines. Chinese embroidery has four distinct regional styles: Shu xiu (Sichuan), featuring mostly natural-world motifs; Su xiu (Jiangsu), in which colours are more naturalistic; Xiang xiu (Hunan), known for emulating paintings, engravings and calligraphy; and Yue xiu (Guangdong), characterised by the use of strong colours, no attempt to produce an illusion of depth, and a prevalence of dragons and phoenix motifs. 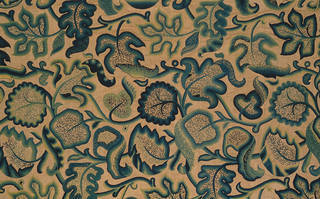 Crewelwork is a rich and elaborate form of embroidery that is at least 1,000 years old. Its name comes from crewl, the fine, two-ply wool yarn that is used to make it. A wide range of stitches is used to outline and then fill in the colourful motifs that make striking use of both shading and texture. In England in the late 17th- and early-18th centuries, crewelwork was fashionable for decorating furnishings such as bed hangings and curtains. Designs originating in this period were heavily influenced by Indian textiles imported by the East India Company, which were characterised by bright and exotic patterns of highly stylised flora and fauna. Goldwork is a form of embroidery worked in gold or gilt-metal threads. Originally using pure gold, this style has been in existence for at least 2,000 years, and has always been associated with wealth and status. Between 1250 and 1350, goldwork in England reached remarkable heights of artistry and technical accomplishment in the pieces known collectively as opus anglicanum (meaning 'English work' in Latin). 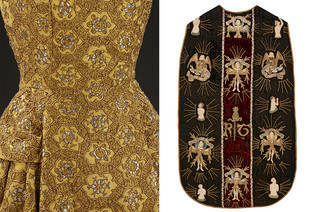 These were gloriously opulent embroideries which often depicted scenes from the Bible. Goldwork remains an important element of religious, military and ceremonial regalia, and is also still used to dramatic effect in the traditional Indian embroidery style zardosi. Many couture designers have often insisted on the use of real precious metal threads – often combined with additional elements like beads and faceted glass – to inject extra glamour into eveningwear. 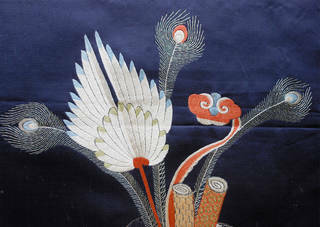 Raised work (or stumpwork) uses a range of different materials and techniques to inject three-dimensional energy into figurative embroidery designs. Bringing imagery 'alive' can be achieved through stitching over padding to build up form, using different threads in a small area to help create shading, and wired slips (small pieces of embroidery worked separately and then added to the main picture) to create delicate leaves, wings and flower petals. 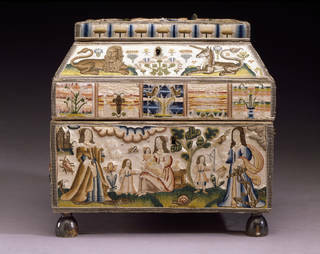 Raised work was a popular means of decorating caskets made and used by girls in the 17th century, with panels worked as part of their needlework education at the age of 11 or 12. Biblical, mythological and classical scenes were all popular themes. 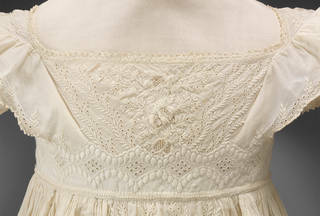 Including both counted-thread and freestyle techniques, whitework is defined more by the distinctive appearance of white-embroidery-on-white-material, than how it is made. The stitching must be smooth and even, requiring considerable skill, and meaning that historically much whitework was produced professionally. As with other forms of embroidery, however, in the mid- to late-19th century it became a fashionable pastime for middle-class European and American women. 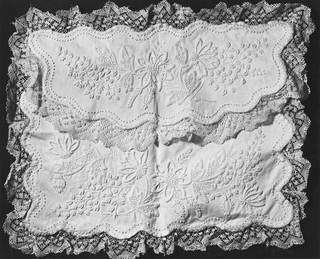 Whitework is commonly used for ecclesiastical linens and garments, as well as nightclothes, christening wear and trimmings, and normally features holes (created either by cutting or drawing threads apart) as an element of decoration. Ayrshire work is the name given to whitework embroidery on fine muslin. It originated in Ayr in Scotland, a centre of muslin production, and became popular in the early 19th century when simple muslin dresses were fashionable. This simple cutwork style is characterised by delicate floral designs with trailing elements, worked in satin stitch (flat stitches worked in sequence to fill areas of a design) with needle lace (lace created with only a needle and thread) filling. Often used to make intricate patterns for collars, cuffs, baby's bonnets and baby's robes, Ayrshire work has many parallels with Indian chikan, another type of embroidery that embellishes light-as-air muslin to great effect. Broderie anglaise is a simple form of cutwork embroidery that doesn't rely on the weave of the fabric. Instead, the foundation fabric is cut, to make decorative holes, with their edges overcast to create a lace-like effect. Designs frequently involve floral motifs, which are particularly suited to the circular and oval perforations of broderie anglaise. Scalloped edges, finished with buttonhole stitch, are a typical feature. 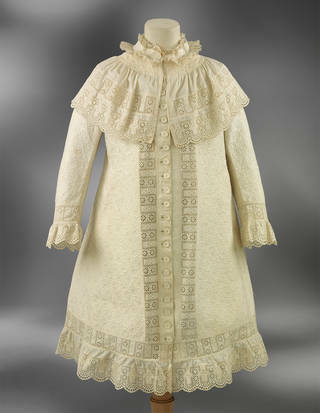 Believed to have originated in eastern Europe in the 16th century, this technique is now closely associated with English embroidery (hence the French name 'broderie anglaise') – and is still commonly used to trim babyclothes, dresses, nightclothes, underclothes and household linens. 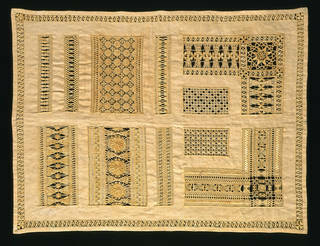 Cutwork describes any form of embroidery based on a woven ground from which sections have been cut away and edged. This style of whitework originated in Renaissance Italy, where nuns created fine textiles for ecclesiastical use, first removing threads, then whole sections of background fabric to fully exploit a contrast between light and shade. This work was later contracted out to hired embroiderers, who established a tradition of decorating linens with intricate cutwork patterns. The obvious labour involved in this form of whitework made it an easy means of signalling social rank, and in Europe in the 16th and 17th century it became associated with royalty and the nobility, with pieces often exchanged as high-status gifts. Cutwork is also the origin of lace: over time, embroiders made larger and larger holes, creating 'reticella' (floating shapes) in which the linen backing fabric was almost entirely cut away, eventually leading to a new kind of fabric known as 'needle lace'. Drawn thread work is a counted-thread form of whitework embroidery thought to originate in Egypt, in which specific threads of the warp (running vertically) and weft (running horizontally) of a backing fabric are cut and drawn out, with the remaining threads stitched together to create intricate patterns. 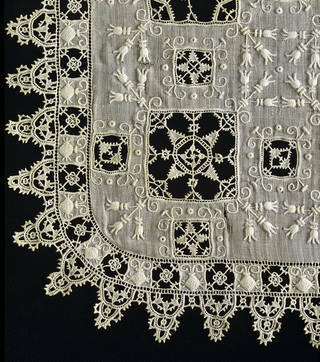 Often used in combination with cutwork, pulled threadwork and/or needlelace, this style was extremely popular for embellishing the borders of table linens and underclothes in the 16th century. Drawn thread has a strong tradition in Scandinavian embroidery, and is used in a Norwegian whitework style called Hardanger to create geometric patterns that rely on relatively small square or rectangular holes. Mountmellick does not, unlike most other forms of whitework, feature holes or open spaces. Instead, it relies on creating a three-dimensional effect, with stitches planned so as to lie on the fabric's surface with as little thread as possible on the underside. To balance this textured embroidery, the edges were traditionally finished with a heavy fringe, creating a sturdy fabric that could be used as bedspread or tablecloth. One of the few needlework techniques native to Ireland, Mountmellick is named after the town in County Laois where it is said to have been developed, around 1825, by Johanna Carter, the headmistress of a school that taught poor women sewing skills. Although Mountmellick was taken up across Ireland, by the mid-19th century it declined in popularity, and failed to be much championed thereafter, despite a brief revival in the 1970s. Pulled thread work (or drawn fabric) can have a similar appearance to drawn thread work, but requires the opposite form of base fabric, one that has a loose weave in which threads can be bunched together by using tight stitches, creating holes either side of a worked line. It is an unusual form of embroidery as the stitches are not really designed to be seen – in pulled thread designs, the holes are the main element and are relied on to create the pattern. Pulled thread became a recognisebale technique in the 18th century, probably due to the popularity of delicate, fine-weave linens, such as cambric and lawn.